Reason for inclusion: This is one of the most highly regarded Film Noirs that I still had not seen. 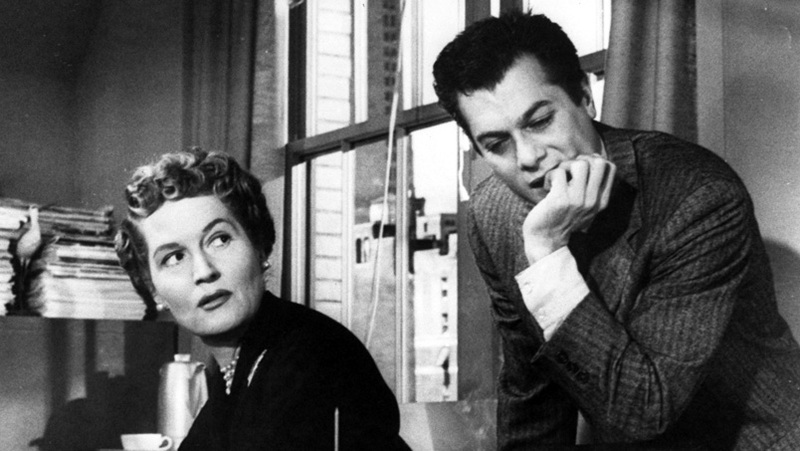 Is there a bigger louse in film than Sidney Falco (Tony Curtis) in Sweet Smell of Success? Here is a man (and I use that term loosely), a press agent, who will do anything and everything to get his clients mentioned in a nationally syndicated newspaper column. He is willing to bribe, blackmail, extort and even pimp out his acquaintances if it helps him make a quick buck. Falco is a sleazy shell of a man. The author of this newspaper column, J.J. Hunsecker (Burt Lancaster), isn’t much better. Rather than ooze slime, Hunsecker uses his power and authority to bully his way through life. He has an ego the size of Texas, and he is especially intimidating to his younger, 19-year-old sister, Susan (Susan Harrison). Susan is in a happy relationship with noted jazz guitarist, Steve Dallas (Martin Milner), and they have begun discussing the prospects of marriage. One problem: Susan desperately wants her brother’s approval, and Hunsecker is not ready to do so. Instead, J.J. schemes with Falco to find a way to break up their romance. Falco, failing at this task much like everything else in his life, grows more and more desperate while aiming to please the very influential columnist. He tries selling “tips” to other gossip rags in an attempt to label Dallas as a “marijuana smoking commie.” What entails is an increasingly foul and dirty game of smearing, with both Falco and Hunsecker seemingly digging themselves deeper and deeper in their power plays. 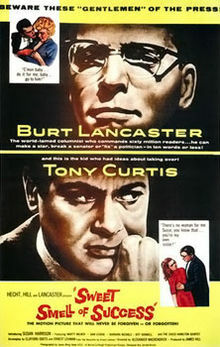 Lancaster and Curtis are terrific in the lead roles, especially the latter. Curtis excels at portraying what is essentially the cesspool of humanity. Even when he is in the distant background during a few scenes, I found myself keeping an eye on him just to see if I could figure out what he had up his sleeve. The character of Falco never stops conniving and scheming his way to the top. 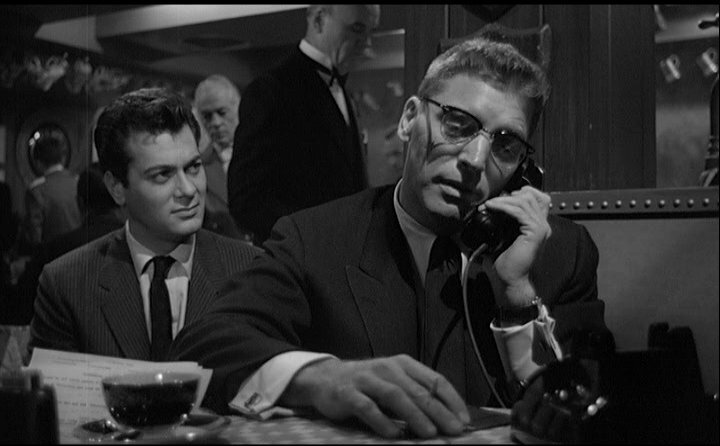 Sweet Smell of Success has some of the best dialogue I have seen in film. It is immensely quotable (as seen throughout this review), and it is a scathing attack on newspaper and print media. This is a film with horrible people doing horrible things, but damn if it isn’t entertaining. Saw it in 2013 too, you liked this one a lot more than I did. I agree on the acting and dialogue. For me the weakness is I could tell from the get-go where the Tony Curtis character was heading. Perhaps I need to give it a second chance some day, as it clearly is an acclaimed movie. Glad you dug it! Yep, I remember your review. I went into this one somewhat cautiously because of it, but I was pleasantly surprised with how much I enjoyed the film. I’m always a sucker for quotable movies like this, but I especially loved the performances from the two leads. Nice!!! 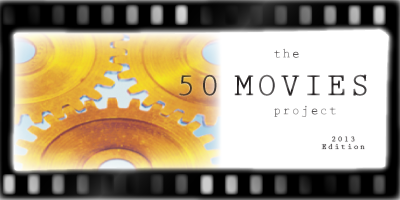 I love seeing the classics getting some love in the blogosphere! You got me wanting to revisit this one. When Tony Curtis died, this movie was considered on of his best roles ever. I have only seen him in one or two other films, but that doesn’t surprise me one bit. He is amazing in this. This review is enough to convince me to give this one a chance very very soon. Great! I hope you enjoy it as much as I did, man. Two excellent leads playing around “Superb Louse” territory. With Tony Curtis’ Sidney Falco edging out Burt Lancaster (Unheard of!). Superb, often razor sharp cinematography from James Wong Howe. And scathing, way ahead of its time, too cool for the room dialogue. Thanks Jack! “Too cool for the room” dialogue is a great way to put it. Some of those lines would never come up in every day conversation, but damn if they don’t make them work! So many great lines. One of my favorites. Thank you for writing about it — this will serve as a reminder to re-watch it again. Thanks, Sam! Much appreciated. Diggin’ the new look over at the Mezzanine as well!